Sri Shuka the son of Sri Veda Vyasa was relating Bhagavata Purana – the exploits of Lord Vishnu-Narayana, in his various avatars entered into to save His devotees from Evil and in some cases to bring forth the right behavior of a true devotee for the benefit of lay worshippers. The Story of the Syamantaka Jewel occurs in the 56th Chapter of the Tenth Canto of Bhagavata Purana which details the exploits of Krishna. Krishna was ruling over Dwaraka, when one day, Krishna’s heralds brought the news that The Sun was coming to visit him. Krishna was playing dice with his friends. Krishna heard the news and laughed at them and said. “No, it is not The Sun who is coming to visit but Satrajit wearing the Syamantaka Jewel. This jewel was a special gift Sun-God made to Satrajit as he was a very dear devotee of his.” Earlier Satrajit had declined to show the jewel to Krishna for fear that if Krishna asked it to be gifted to him, he will be forced to refuse and thus as a vassal he would incur the wrath or at least the displeasure of the King. The special character of the Syamantaka was that every day it created a Gold pellet equal to eight times of its own weight. Further wherever the jewel is worshipped or worn on person with respect, it would prevent famines, floods or other natural calamities from happening. Once Satrajit’s brother Prasena happened to wear this Jewel and mounting a horse he went to the forest for hunting. In the forest he and his horse were killed by a lion. The lion picked up the jewel and went to its den. The lion was spotted by a Bear called Jambavaan, who was living in a Bear-hole not far from the lion’s den. He killed the lion and carried the Jewel to his hole where he made it a plaything for his kid son. In the meanwhile, Satrajit finding that his brother had not returned home made it public that Krishna might have abducted his brother Prasena for the jewel. The hearsay traveled fast and reached the ears of Krishna. Krishna felt obliged to clear himself of the blame- obviously a false accusation- by getting to the root of the business. He went with a search party and tracked the Jewel to the Bear’s Hole. Finding that it was dingy and dark inside asked the people to wait outside for him and entered the bear-hole alone. He saw that a child was playing with the Jewel. So, he went to his side with the idea of snatching it from him. Seeing an intruder, the nurse cried for help. 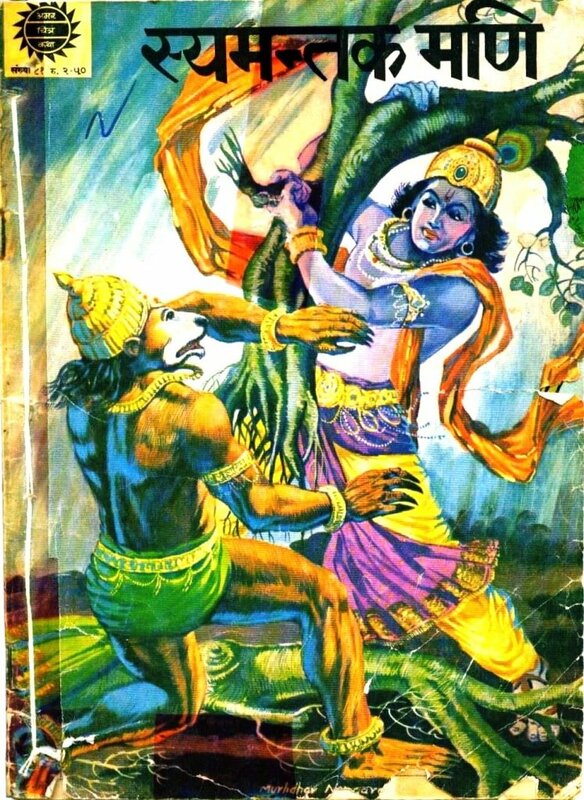 Jambavan came rushing in and picked up a fight with Krishna. The fight went on for 28 days. They fought with everything at their command- trees, boulders and weapons and finally settled down to fists and blows. Seeing that Krishna was not tiring even after 28 days, Jambavan felt He was no ordinary man. He requested the Lord to reveal himself. Krishna did so and revealed Himself in the form of Rama to whom Jambavan was devoted. Jambavan realized his mistake and after begging His pardon gave the jewel in a platter to Him. Along with that Jambavaan gave his daughter Jambavati in marriage to Krishna. Meanwhile the people (the search party that accompanied Krishna) went back thinking that the Lord would have succumbed to the bear and left for the city, grieving for his fate. Once in the city, they even conducted obsequies for Him. Krishna surprised them by not only returning back victorious, but with a bride in tow! There was celebration to which Satrajit was invited and he was presented the Syamantaka Jewel with all honors, and the report of what had happened to finest detail. Satrajit obviously felt extremely sorry for having falsely accused Krishna and sullied his reputation. He made amends by not only offering the Syamantaka Jewel, but his dear and beautiful daughter Satyabhama, in marriage to Lord Krishna. Thus, did Krishna not only clear the blame but was also blessed with two wives out of this exploit of His. However, Krishna wanted to know how and why he had to come by this false accusation and why he had to go through the whole gamut of experiences. He called Sage Narada, the Wanderer of the Three Worlds, to tell him the reason. Sage Narada told Him that, soon after the wedding of Lord Shiva and Parvati one day, Shiva had been out on personal business, when Parvati wanted to go for a bath. Since Shiva and Parvati lived in Kailas where everything was out in the open, Parvati made out of the toilette material, an image of a boy, and breathed life into him. She instructed the, boy to guard their home from any intruders and went to bathe in the Mansarovar. This boy faithfully stood guard carrying the Powerful Mace that his mistress had bequeathed him. Lord Shiva returned from His business with his retinue. He wanted to enter His abode but was stopped at the door, by the boy. Shiva’s followers told the boy who He was but he wouldn’t budge. What started as an altercation slowly blew up into a full-blown war sucking the whole of the Army of Gods into it. The boy stood unfazed, and never let anyone past the door. Lord Shiva took up the job Himself, and when the boy did not heed his polite entreaties, simply chopped his head off. Parvati returned from her bath to find Her boy lying headless! She told Lord Shiva that the boy was their son! Lord Shiva realized His mistake and bade his followers go and search for the head of the first animal or human that lay resting in any of the quarters. It came to pass that, the followers soon bought the severed head of a majestic Elephant. The Lord placed it on the boy’s neck and caused him to come alive! All the Gods felt they had wronged the boy and the Goddess Parvati, in particular, so in their turn they bestowed several boons on him. The boy now, elephant headed, was named Ganesha and was declared the Lord of Obstacles and Prosperity. He was given a suite of weapons and dominion over the Three Worlds as the First Ever God. It was made mandatory that he be worshipped at the start any ritual whatsoever and had the rights to disturb any that were in contravenes to this ruling. Thus was born the Lord Ganesha on the fourth day of the Bright Fortnight of the Lunar month of Bhadrapada. This day being treated as his birthday, the Lord Ganesha, is worshipped with love and devotion by one and all. He is made the offering of “kozhakkattais”(Steam cooked Rice-balls encapsulating a mix of jaggery and coconut gratings cooked in ghee). He ate His fill in every house and was going towards Kailas at nightfall when he tripped and fell on the way. In the impact his swollen tummy split and the kozhakkattai’s rolled out. Ganesha quickly repacked them into his tummy before anyone could see. But the Moon had seen him and was laughing his head off. Ganesha went up to His mom and dad and tried to prostrate before them as is the custom. He wasn’t able to touch all the parts of His body to the ground as is recommended. For when His head touched His feet would lift off and vice-versa. The haughty Moon laughed at Ganesha’s plight once more. Parvati, was hurt by this and She cursed that anyone who ever set his eyes on the Moon would come to grief. The Moon now felt sorry for his act and begged pardon of Ganesha and His Mother and begged that his curse be reduced in intensity. Parvati said, “May it be ordained that on the Fourth Day [Chaturthi] of the Bright Fortnight of every month alone let people follow this discipline. The Moon again begged that this was also very harsh. It was then that the sentence was reduced thus. On the Ganesh Chaturthi day alone shall anyone who beheld The Moon shall come to grief in the form of some false accusation or the other but on all other Chaturthis (Fourth Day of the Bright Fortnight of every Month) anyone who shall keep a vow of fasting till Moonrise and shall partake of regular food only after worshipping Ganesha, making his offering to Him first, shall be delivered of their difficulties and troubles! So, what began as a curse was partially converted into a blessing for the troubled of the World. That is how even the curses of Gods turn out to be beneficial for humankind. “So”, said Sage Narada to Sri Krishna, you had had a glimpse of the moon reflected in the bowl of milk that you carried into your house after milking the cows on the Ganesha Chaturthi night that passed. You must have heeded Parvati’s curse and avoided looking at the Moon. The curse took effect and made you go through the pain of blame removal. The Lord then blessed that anyone who shall read this story on the Ganesha Chaturthi shall be relieved of the effects of the curse.